If you've seen Planet Earth, the epic documentary series from the BBC, you may remember the beauty of the Okavango Delta in Botswana, a remarkably undeveloped haven for wildlife. That episode left an indelible mark on Pradeep, and the Delta has been on his travel list ever since. After doing some research, we learned that Botswana had a multitude of natural wonders to explore. Colleagues from Cape Town also endorsed Botswana as an ideal location for what would be our first safari. With that, we turned to the experts at UK-based Wild Frontiers, a tour agency specializing in adventure travel and one that has extensive knowledge of sub-Saharan Africa. We chose Wild Frontiers after hearing founder Jonny Bealby at an event in London share how the company partners with well-established, eco-friendly lodges that give back to the community. We wanted our tourism dollars to be spent responsibly in Africa, and Wild Frontiers helped us accomplish that. Our custom itinerary included stops at three unique destinations in Botswana, ending at Victoria Falls in Zimbabwe. Each of the Botswana camps offered distinctive ways to immerse ourselves in the natural beauty around us, by air, land and water. Thanks to expert local guides, we learned not only about the daily lives of the beautiful creatures surrounding us but also about the delicate ecosystem and the importance of its preservation. Join us for our favorite moments of our first safari, which will certainly not be our last. If you're interested in planning a safari, we highly recommend working with an experienced travel agent or tour company. Here are the particulars from our Botswana adventure. TOUR COMPANY: Wild Frontiers, who planned a bespoke trip that included full-board lodges, transport to/from the camps and plenty of pre-trip information including packing lists and tipping etiquette. TIME OF YEAR: Early April, at the end of the rainy season and going into the dry season. 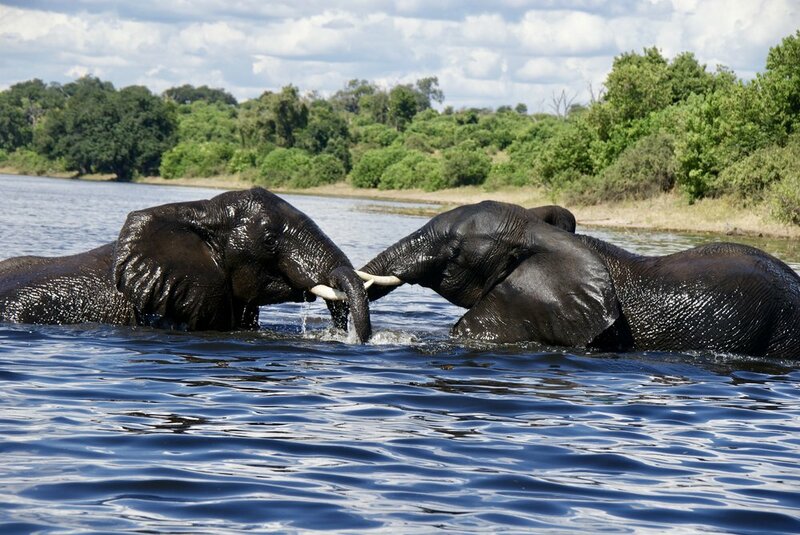 Pros: with all the water, the Okavango Delta and Chobe National Park wetlands were lush with greenery and animal life. Cons: the animals have an easier time hiding in the tall grasses, so some may be harder to spot. TRAVEL: By air, first spending a few days in Cape Town separate from the safari trip. London to Cape Town - 11 hours; Cape Town to Maun, Botswana - 2 hours; inter-country air travel via small Cessna planes, ranging from 20 minutes to 1 hour in flight time; Victoria Falls to London via Johannesburg - 12 hours. STAY: All lodging was recommended and booked by Wild Frontiers. We thoroughly enjoyed our stay at each of these unique lodges, from Gunn's Camp in the heart of the Okavango Delta, to the rustic Linyanti Camp, in the wild bush of northern Botswana near Chobe National Park, to Muchenje, an upscale lodge overlooking the waters and vast wildlife of the Chobe River. Our final stop was The Victoria Falls Hotel, a five-star hotel with spectacular views of one of the Seven Natural Wonders of the World. EAT: All meals were included at the safari camps. A typical day included a light breakfast at 6am prior to the morning safari, brunch at 11am afterwards, afternoon tea (sweet and savory treats) at 3pm before our afternoon drive, and dinner at 8pm. Considering we were in the middle of nowhere, the cuisine at all three camps was splendid. WANDER RATING: N/A - one does NOT wander alone while in the wilds of Africa; leave it to the guides to provide an amazing and safe experience! Have you been on an African safari? Share your tips and recommendations with the Compass & Key community in the comments below.